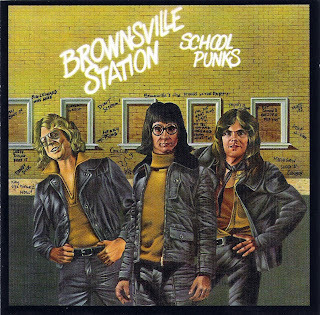 Flush from the success of "Smokin' in the Boys Room," which climbed all the way to number three on the pop charts, Brownsville Station was eager to keep the party going, deciding the best way to do so was to capitalize on the juvenile delinquent image they captured so perfectly on their big breakthrough. Hence, the title of their quickly released follow-up is School Punks; the illustrated cover pictures the trio all decked out in leather in front of a graffiti-ridden school wall; the opening cut, "Kings of the Party," references the hit; "Meet Me on the Fourth Floor" rewrites it; and "Mama Don't Allow No Parkin'" and "Fast Phyllis" tell similar tales of high-school misadventures. Unlike Yeah!, which had only two originals, School Punks is heavy on new material from Cub Koda and Michael Lutz, which are punctuated by well-chosen covers like Geno Washington's "I Get So Excited," a blues medley of "I've Got Love if You Want It/I'm a King Bee," and Gary Glitter's "I'm the Leader of the Gang." The other big change is that Koda has become the unofficial leader of the band. He sang "Smokin' in the Boys Room" and he sings everything here with the exception of the cover of Dee Clark's "Hey Little Girl," which Lutz sings. Cub gives the band an appealing, funny, down-and-dirty persona that suits the band's heavier attack on School Punks. While there's nothing as undeniable as "Smokin' in the Boys Room," "Kings of the Party" and "I'm the Leader of the Gang" are rampaging rockers, "Ostritch" is a very funny stomping country-rocker, the band gets to stretch out on the blues medley, and the whole record just feels like one nonstop party. Wow! Great album. thank you very much!